Knockeen Hills produces Elderflower Gin & Irish Poteen also with G. I. Spirit Status protection from the EU. 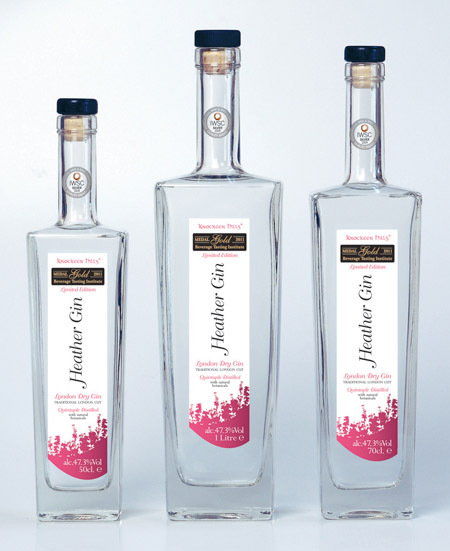 A super-premiun quintuple distilled traditional London Cut Dry Gin with natural botanicals. A unique and noticeable smoother delivery of spirit on the palate is achieved using its own, exclusive Irish Whey Distillate. This clean, clear, transparent distillate contains only a minute amount of congeners at 0.024%. 'London Cut' is a description, reserved for gin where the botanicals have been cut and distilled in London; the traditional historic centre of gin distilling. This is one of a small and distinguished group to qualify for this prestigious hallmark of quality. 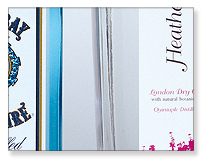 To obtain an accurate assessment of the outstanding Heather 'London Cut' Gin bottles, in comparison with other gins, please click on the image above. We reccomend only using tonic brands that only use pure sugar and do not use saccharin. Knockeen Hills also produces an award winning Elderflower Gin. Click below. Click here to enlarge the Elderflower bottle. A contemporary design, crisp, clean, premium bottle and label has been carefully selected. The botanicals are steeped in the spirit for at least 24 hours; a process that improves their complexity within the gin. They are selected for lightness, flavour and fragrance, and enabled with the addition of natural heather. The result, a truly outstanding boutique Gin, dispensing with the addition of lemon, for a traditional G & T.
Knockeen Hills also produces a range of ultra-premium triple and quadruple-distilled high strength Irish Poteens up to 90% vol. This range was awarded over 10 Medals including a GOLD MEDAL at International Wine & Spirit Competitions. At the 2012 Ultimate Spirits Challenge of the USA, our Farmers Strength was awarded 92 points with the ACCOLADE: EXCELLENT, HIGHLY RECOMMENDED. The web site can be viewed by clicking on any of the label images below. Click here to enlarge the Irish Poteen labels. The Knockeen Hills spirit brands include the above and to be taken to each website, please click on the image. ©Knockeen Hills Heather London Dry Gin. Registered in England Company No. 6897685.